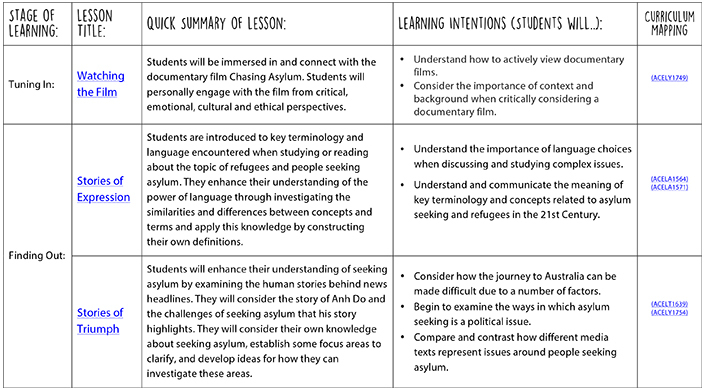 This resource has been written to support the film Chasing Asylum and address the content descriptors of the Australian Curriculum: English. Learning activities in this resource are most suitable for use with Year 10 English students, however can be amended and adapted for other year levels and subjects. 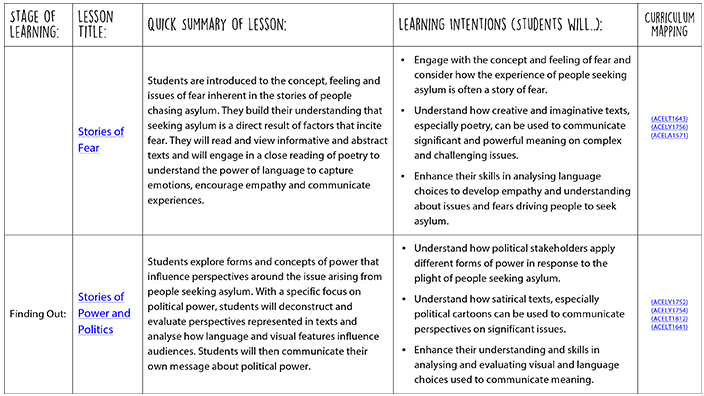 The lessons incorporate clips from the film Chasing Asylum, as well as a number of other real-world articles and pictures as learning stimulus. The learning activities encourage student participation through movement, group work, visible thinking routines and use of ICT for investigation and demonstration of thinking and learning. 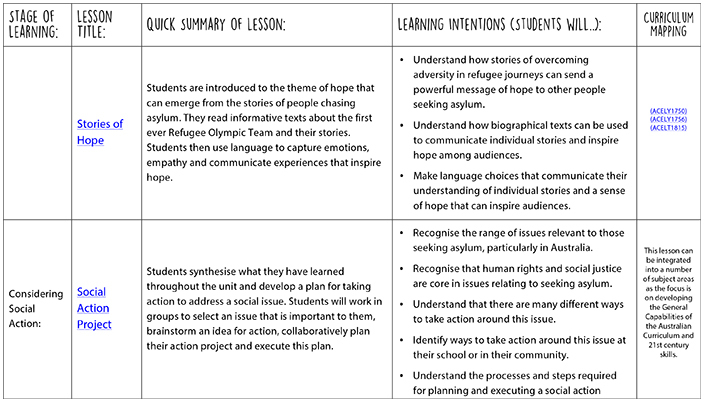 The lesson activities support students to create artefacts for the purpose of formative and summative assessment. 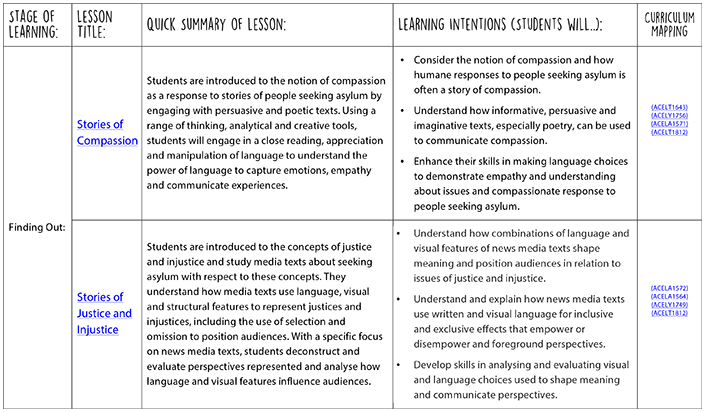 Students are required to engage in meaningful reflection at the conclusion of each lesson, and are encouraged to continue their thinking and scrutiny about the topics addressed throughout the lessons. The investigation and learning completed throughout the unit is applied to students’ local context through a scaffolded student-led social action project, wherein students choose an issue to raise awareness around, examine how they will take action and the manner in which they will present their learning for exhibition to a real audience. Access the Stories of Chasing Asylum unit here. This unit addresses the content descriptors of the Australian Curriculum: English. 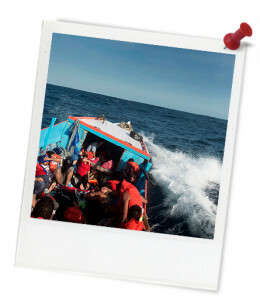 This resource is made up of a series of sequenced activities that incorporate clips from the 2016 documentary film Chasing Asylum. The lessons can be taught as an entire sequential unit of study, or as individual lessons. Chasing Asylum exposes the real impact of Australia’s offshore detention policies and explores how ‘The Lucky Country’ became a country where leaders choose detention over compassion and governments deprive the desperate of their basic human rights. The film features never before seen footage from inside Australia’s offshore detention camps, revealing the personal impact of sending those in search of a safe home to languish in limbo. Chasing Asylum explores the mental, physical and fiscal consequences of Australia’s decision to lock away families in unsanitary conditions hidden from media scrutiny, destroying their lives under the pretext of saving them. To watch the documentary, stream it on Kanopy and Clickview or purchase the DVD at the ATOM Education Shop. Speaking with students, staff, family members and the local community prior to screening the film in order to anticipate possible responses that may arise. Setting some classroom agreements with students (to ensure ownership and agreement) that create a safe space for engagement with the learning stimulus and activities. Encouraging students to respond to and challenge ideas rather than people. Encouraging students to approach the film by thinking critically about the process of making and viewing a documentary film. Read the Things to address before viewing and studying Chasing Asylum factsheet for more detailed guidance.